It's like a super-annoying ex: It comes around way too often and stirs up a fight that leaves you with a pounding headache. In the next few weeks, Congress must decide about raising the ceiling on how much debt the federal government may carry. If lawmakers whiff, the U.S. Treasury Department won't be able to pay all the country's bills in full and on time. When exactly? The Bipartisan Policy Center and the Congressional Budget Office estimate that day could come within a week or two of Nov. 3, the day when Treasury Secretary Jack Lew says he'll run out of special accounting measures to keep the country below the debt ceiling. What's the debt ceiling again? It's a cap set by Congress on how much the federal government may have in outstanding debt. That limit applies to debt owed to public investors (i.e., anyone who buys U.S. bonds), plus debt owed to federal government trust funds such as those for Social Security and Medicare. Today the ceiling is set at $18.113 trillion. 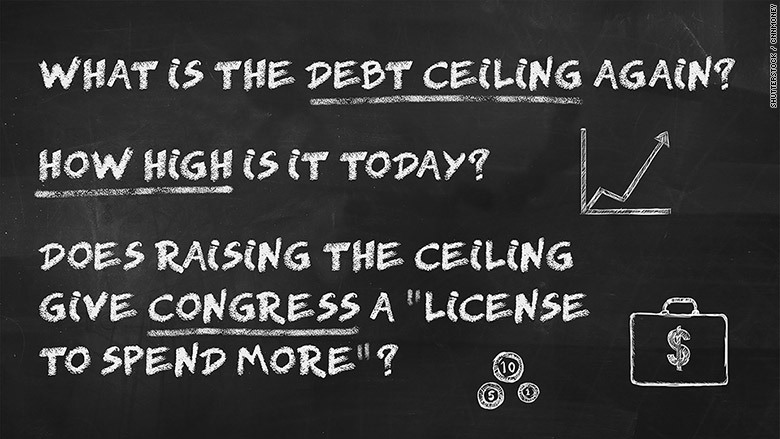 Is it true that raising the debt ceiling gives Congress a "license to spend more"? So, how often has Congress raised the debt ceiling? Often. On average, more than once a year. Since 1940, there have been 95 measures enacted to adjust the debt limit in one way or another. Sometimes lawmakers have raised it by small amounts, other times by large amounts. Sometimes they've raised it "temporarily" with provisions for it to "snap back" to a lower level. And sometimes they've "suspended" it when they can't agree on raising it outright. A suspension is a wink & nod maneuver that basically lets Treasury borrow as needed to pay bills without regard to the limit. Then, when the suspension ends, the debt limit instant-presto resets to the old cap plus whatever Treasury borrowed during the suspension period. The latest suspension ended in March. Ever since, Treasury has used accounting maneuvers -- perfectly legal ones -- to keep paying all the country's bills without breaching the ceiling. Why does Congress even bother with a limit? In theory, setting the debt ceiling is supposed to help Congress control spending. In reality, it doesn't. Not meaningfully anyway, although there have been times when the debate over raising it has yielded some fiscal restraint. The problem is that the decision to raise the borrowing limit is usually divorced from lawmakers' legislative decisions that necessitate more spending in the future. It would be much better, budget experts say, to authorize debt limit increases whenever Congress passes bills to raise spending or cut taxes, both of which can add to deficits. Does the debt limit fight threaten to shut the government down? No. But it could get lumped in with that other fight Congress will be having this fall over spending -- and that spending fight could result in a government shutdown. Some Republicans have been threatening to shut the government down unless lawmakers defund Planned Parenthood because of a controversy over how the group handles fetal tissue after an abortion. That's on top of other disagreements lawmakers will have over adhering to spending caps. On Sept. 30 -- with hours to go before the start of the new fiscal year -- lawmakers temporarily averted a shutdown by passing a short-term bill that funds the government until Dec. 11. How everything will get resolved this fall is still very much up in the air, especially now that there is a leadership vacuum in the House following Speaker John Boehner's surprise decision to resign. Lawmakers may decide to propose a joint measure that both authorizes spending for the rest of the fiscal year and raises or suspends the debt ceiling. Or they may fail to do so and drag out both fights. In any case, while a shutdown would be aggravating and wasteful -- and could harm growth if it goes on a long while -- it's nothing compared to the risks if Congress fails to address the debt ceiling in time. So what happens if Congress doesn't raise the ceiling? No one knows for sure. But at the very least, it would be a chaotic disruption and make Washington look bad in the eyes of investors, including those around the world who lend the country money. Here's why: To pay bills and benefits, Treasury must borrow money to make up the difference between what it spends and what it takes in. So if Congress doesn't act in time, and Treasury can't borrow, it eventually will not have enough cash to pay all the country's legal obligations. Within a week or two of Nov. 3, the Congressional Budget Office and the Bipartisan Policy Center estimate the Treasury will no longer have sufficient cash and revenue on hand to pay every bill as it comes due. That's a good question with no clear answer. Most experts think Treasury would do all it could to prioritize interest payments on the debt, lest the United States default on its bonds, since that could send markets plunging and interest rates soaring. But it's not clear how investors would respond if Treasury makes interest payments but delays payments to government contractors, federal workers, taxpayers due refunds, veterans, seniors and anyone else to whom the federal government has a legal obligation. "Federal employees, contractors, program beneficiaries, businesses and state and local governments would find themselves suddenly short of expected cash, causing a ripple effect through the economy," Donald Marron, a former Congressional Budget Office director, told lawmakers during one of the last knock-down-drag-out fights.